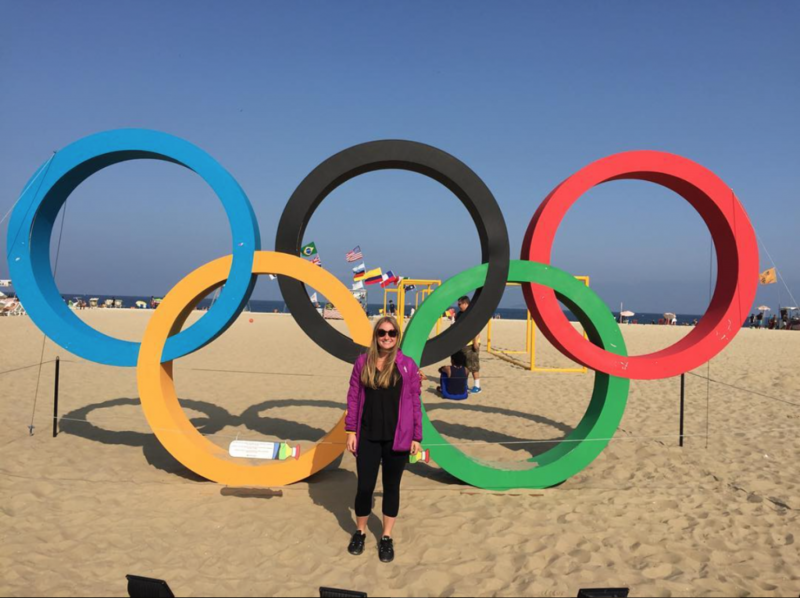 Long before many of the athletes had even qualified to compete at the 2016 Olympic Games, Lindsey Schnitt knew she was Rio bound. 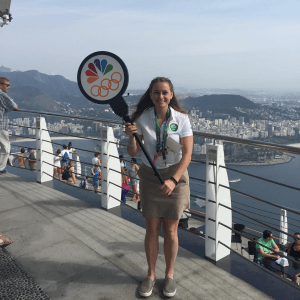 In fact, when Schnitt interviewed to be a coordinator in the events department at NBCUniversal, she found out the position would mean a chance to be part of the Olympic experience. “When I interviewed for my job about a year and a half ago, I remember my future boss asking me, ‘Are you ready to go to Rio?’ I remember smiling and being so excited because that would be an opportunity of a lifetime in the work world,” she said. 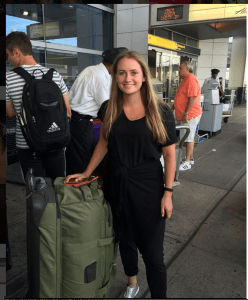 Schnitt, who has celiac disease, approached traveling to Rio the way she does all her trips—by doing her due diligence. Having already studied abroad and being comfortable traveling with celiac disease, she knew what to do. After consulting with her gastroenterologist, Dr. Peter Green of the Celiac Disease Center at Columbia University, about what to look out for in Brazil, she began to prepare for the trip. 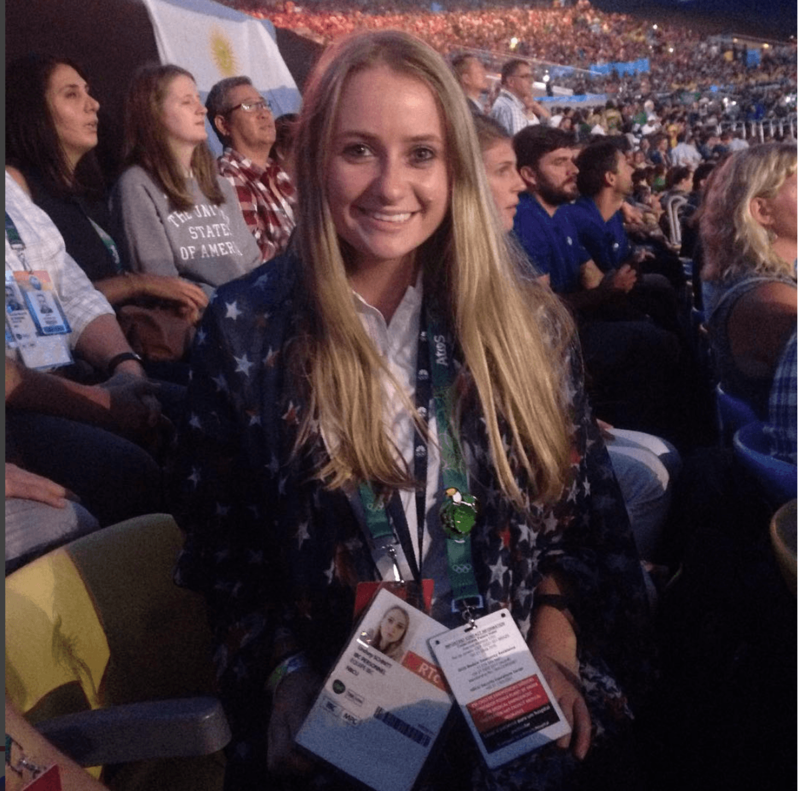 She researched the gluten-free offerings in Rio, printed translation cards stating that she is gluten-free and packed plenty of gluten-free food for her month-long stay, which would begin before the games began and continue through the duration. “I couldn’t live without my chocolate chip cookie dough LÄRABAR. I brought five boxes with me,” Schnitt says. She also packed small protein balls, pretzels, popcorn, packets of Nutella and other items that she could eat on the go. 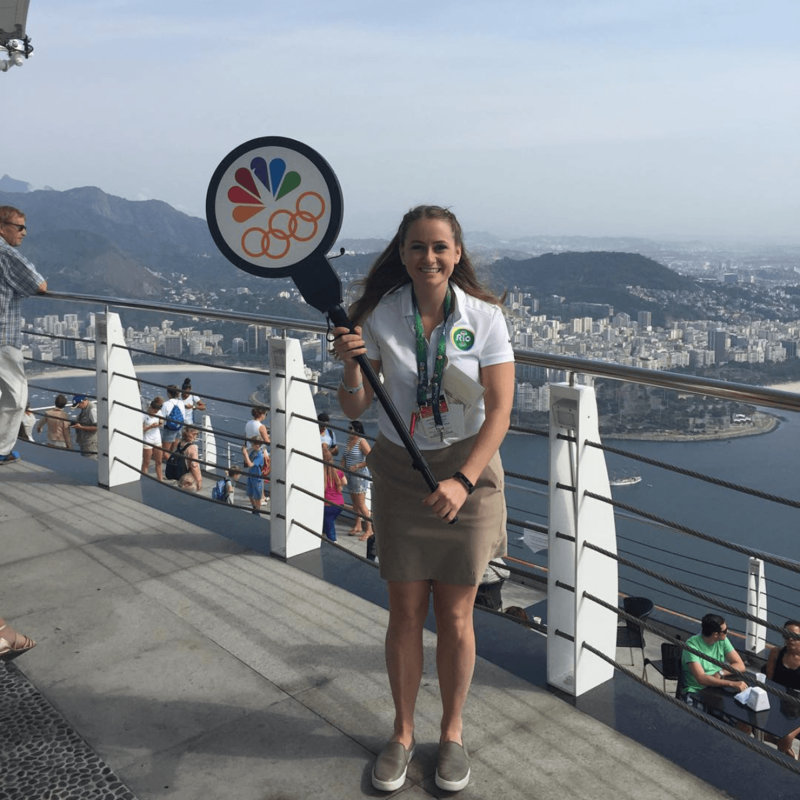 Schnitt worked on the NBCUniversal hospitality program in Rio. Her days were spent overseeing daily trips provided for clients to Rio’s famous sites—Samba City, for a behind-the-scenes look at Rio’s Samba Schools involved in the annual Carnival celebration, and Sugarloaf Mountain, where visitors can ascend a mountain peak that provides magnificent views of Rio. Schnitt worked the tours and joined clients for the lunches that followed. 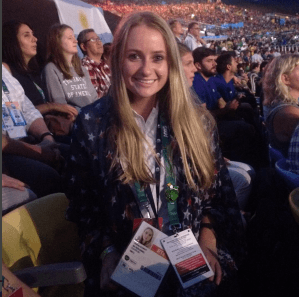 During her month in Rio, Schnitt worked long days between tours and meetings. But her time in Rio was not all work, as she had the opportunity to immerse herself in the Olympic culture and attend some of the events. After returning from Rio, Schnitt shared what an average day was like during the 2016 games. I would wake up around 5:45 a.m. and just kind of spent some time in my room reading the news, and then by 6:45–7:00 a.m., I would leave for the office. What was an average day like for you? I was at the office by 7:30 a.m. at the latest. I was usually in before that doing some research. I would leave for my tour at 8:45 or 9:00 a.m. It could be 10 people or it could be 58 people. I would be in charge of getting them from point A to point B and telling them exactly what our meetings times were and explaining the day to them. For lunch, because I was working the tours I would join the guests at a restaurant. We had translators with us and I would say the translators were key. I felt is that there are a ton of gluten-free options like you wouldn’t believe, but it’s the language barrier for cross-contamination that becomes the tricky part. It did take a little learning, a little help with the language, but eventually they got it and made me what I wanted. And what I also think is really cool about the Brazilian culture: Everything there is labeled ‘Não contém glúten’ if it doesn’t contain it. I think that was my favorite part about any time I would have something that was in a bag or a can or bottle it had proper labeling. The olive oil was labeled gluten free. The balsamic vinegar. Those things that sometimes can be so tricky. You could Google it a hundred times, but the answer was just there for you. Did you try any of the gluten-free products you found? I tried the gluten-free cheese bread, which we had at our hotel, and I’m not really a cheese eater, but I lived on that. There’s nothing out of the ordinary that I tried that I was surprised to see. Dinner we had at the hotel most of the time and it was a buffet. They had labels for what was gluten free and what wasn’t. Did you have the chance to attend any of the sporting events? Yes, I was fortunate enough to go to Opening Ceremony. I also went to beach volleyball two times, including the bronze match for the women, which was really something very special. I saw Michael Phelps’ swim his last race, and my favorite part about that was we were on TV during the gold medal ceremony waving the American flag. It was a very special moment in history. I also went to the men’s basketball gold medal match. It’s different because you’re still working so if anything pops up, you’re hopping out of your chair. My favorite part was being with the clients and seeing them have a good time. At the end of the day, when everyone got off the bus with a smile on their face, I knew we’d done well that day. What did you take away from the experience in Rio? There’s so much that I took away from it. I took away the fact that, number one, it’s amazing, as cliché as it sounds, to see the world come together. I was on the phone with my boss the other day and I said to her, ‘I just want to let you know that I know this is work, but really as a young kid, I thought having a career like this wouldn’t be attainable, not because I’m not hardworking, but you just kind of think of the world, and these things just seem so far out of reach—even if you reach for the stars.’ It was really special. I just don’t take these opportunities for granted. I like that I was also a go-to person for guests with food allergies. Since I understand the severity of allergies I was able to ensure an enjoyable dining experience. 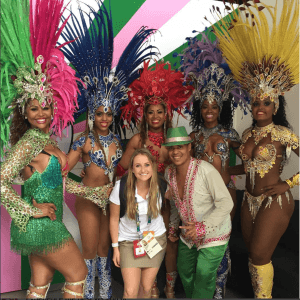 Has this experience in Rio changed your thoughts on traveling with celiac disease? I’ve never wanted to be held back by celiac because it’s not my choice to have it. I think that this allowed me to see once again that anything is possible anywhere. Of course, certain things are difficult and there are little bumps you have to get over, but I would say it just reminded to never say no to an opportunity based on the food. I could live out of a suitcase, honestly.